Part: # 00209 Size: 16 oz. The 16 oz. 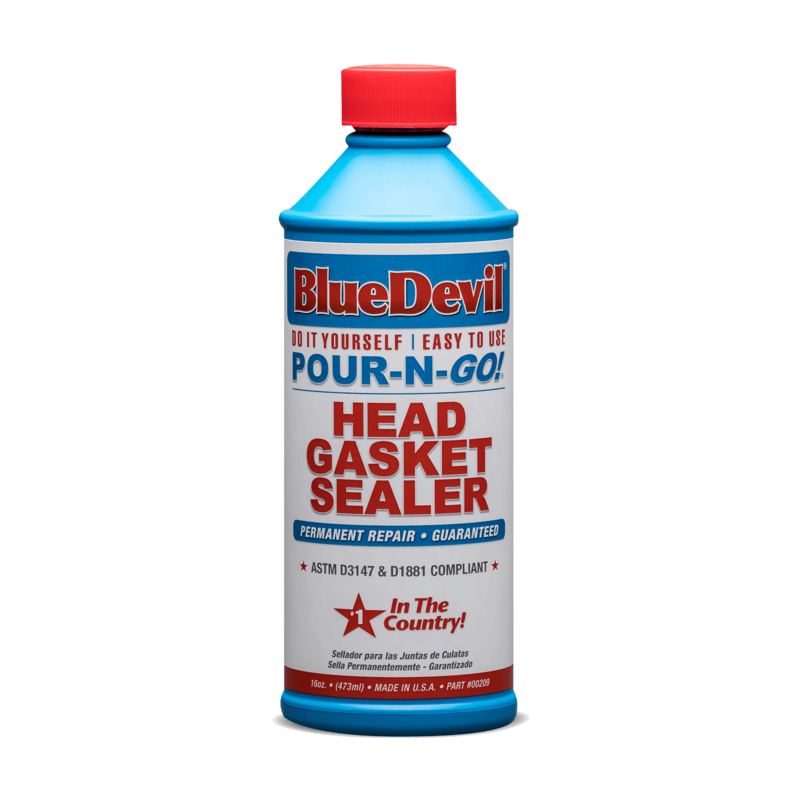 BlueDevil Pour-N-Go BlueDevil Head Gasket Sealer is formulated for the Do-it-Yourself customer who has limited time, or is not mechanically inclined. The 32 oz. is the viable source for customers with larger cooling capacities, severe cooling system leaks, or garages that want two applications out of one bottle. The 16 oz. is intended for the customer seeking a single repair on a 4 or 6 cylinder engine. The ease of use, along with the savings in cost, make this 16 oz. BlueDevil coolant leak sealer an excellent retail option. IMPORTANT: When engine is cold remove radiator cap. ENGINE MUST BE COLD BEFORE STARTING PROCESS (Steps 1-5). If the radiator is full, drain down the antifreeze to allow enough capacity for BlueDevil. After pouring BlueDevil slowly, replace radiator cap. Let vehicle idle with CAP ON for 50 minutes maintaining normal operating temperature. Top off radiator with antifreeze and water. BlueDevil can remain in the system. CAUTION! Keep out of reach of children. Avoid eye or skin contact. If eyes or skin become irritated, rinse with cold water immediately. If swallowed, drink large volumes of water. Consult a physician if discomfort occurs. After using Pour-N-Go still I was experiencing dripping drop once in a five minutes underneath. Next day nothing and diving over a week never loosing coolant, not even a drop. I am so happy with the product, I am going to buy now OIL leaking product even though, I do not have oil leaking. I love this product!! A big THANK YOU to the BlueDevil team! The Gasket sealer worked perfectly! We used it exactly per the book and it did exactly that: seal the Head gasket. We used it on an old for Transit van. Before, it was producing a thick white smoke, the engine was running very poorly and it was drinking the coolant. The garage confirmed the diagnosis: broken Head Gasket; they also refused to do the repair as it would cost too much. Since we used the Head Gasket Sealer it is again on the road, driving like before, every day, for an extremely low cost! Thanks again and carry on! It permanently repairs cooling system leaks such as radiators, heater cores and freeze plugs. It also permanently repairs most blown head gaskets, cracked heads, warped heads and cracked blocks. My car is overheating. Will BlueDevil correct this? No. All cooling related problems must be solved first. Defective fan switch, fan clutch, clogged or restricted cores, heavy scale and sediment deposits, or systems jellied from antifreeze must all be properly functioning and capable of adequately cooling the vehicle. BlueDevil reacts to temperature differential created by airflow at the leak point. That temperature differential is the catalyst for the chemicals in BlueDevil to react and form its chemical weld. My thermostat is hard to reach. Do I really have to remove it. No, BlueDevil is an easy Pour-N-Go product. 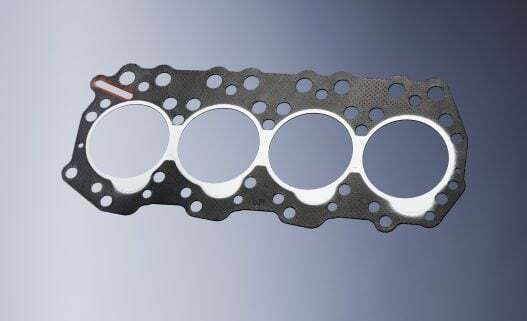 What are the tell tale signs of a worn or leaking head gasket? Will BlueDevil prevent a gasket from blowing? No. There are no preventative claims made for the product. My freeze plugs are the soft type. Will BlueDevil work on them? Yes, BlueDevil will seal leaks in all types of freeze plugs. Does BlueDevil work on plastic heater cores? Yes, it is suitable to repair all types of leaks in all types of heater cores. Are there any applications where BlueDevil will not be effective? BlueDevil should not be used to seal seam leaks in radiators or heater cores. Will BlueDevil work on aluminum engines? Yes, BlueDevil will bond to all metal types-aluminum, steel, cast iron, even plastic cores and tanks. Will this product knock me out of an engine job? No, the application should be used for those customers who are unwilling or don’t have the money to spend on a car that would not justify the expense. Will you guarantee your product to work? BlueDevil will work when the diagnosis is correct and it has been used in accordance with the directions. I tried the product and my radiator has a white crystalline deposit or jell, what is this? 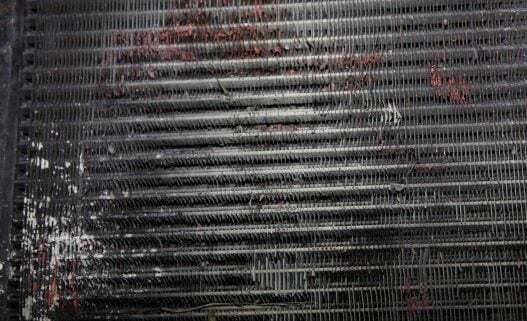 These are telltale signs of a radiator that is in need of service. When fluids are not changed often enough under severe operating conditions or in areas with hard water, scale deposits form in the passages of the core. Sometimes the old fluids will jell or crystallize and can be seen in the system. To remove these deposits flush cooling system using a flushing agent or a flushing machine.